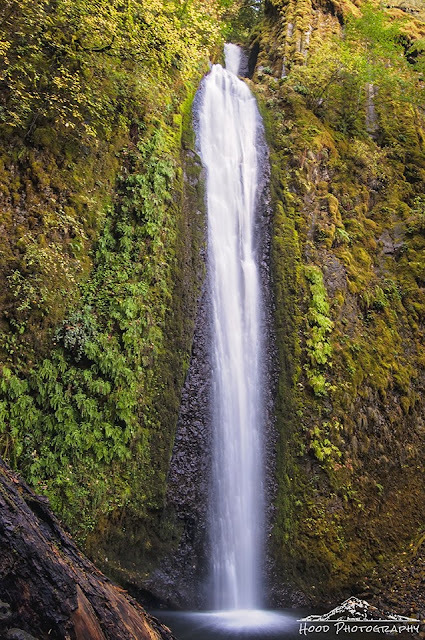 This is Gorton Creek Falls, a two-tiered, 115 drop nestled in the Columbia River Gorge. The falls is a bit of a challenge to reach. I am fairly surefooted and do not mind having to get dirty and/or wet in order to get to where I am going, having grown up in the woods. But it was still an interesting adventure to reach my destination. The trail to the falls dead ends downstream a ways at nearby Emerald Falls, which I posted about last week. From the end of the trail, you must navigate along the boulders, fallen logs and thorough portions of the rushing creek for another 200 yards or so, gaining about 150 ft. in elevation along the way. I was very glad I came prepared and did this portion of the hike wearing my rubber boots! Suddenly, the deep canyon opens up into an amphitheater and the cascade drops down ahead of you. Because of the scramble, I was pleased when I reached the waterfall and was entirely alone. I took my time taking in the peacefulness before trekking back out the way I came. Such a pretty ribbon of water! That looks like a stunning place to be. Another form of body of water that I like most the waterfall. Love it!